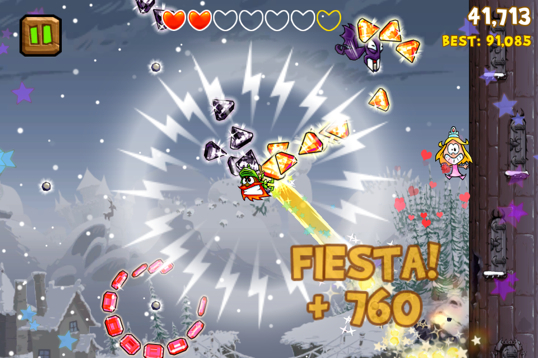 New heroes get into the swing of things with Chillingo's upcoming title. Chillingo's Knights of the Round Cable is more than a catchy play on words. The publisher has a great feeling about this upcoming iPhone and iPad title, and having played it, we share the company's enthusiasm. This is exactly the type of "casual" game that quickly turns into an obsession, one we look forward to enjoying on a daily basis later this summer. As with many iOS games, the concept is relatively simple to grasp. 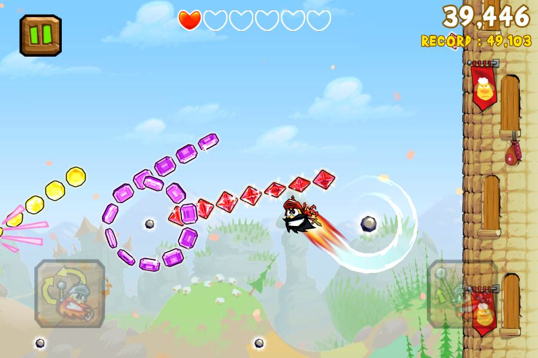 Set in a medieval world, the goal is to guide a heroic knight through a series of stages gathering as many multi-colored gems as possible by swinging him around strategically-placed anchor points. That said, there are two virtual buttons to worry about. The right latches onto an anchor point. The left, meanwhile, controls direction while attached to the anchor point, where pressing it determines whether the knight swings clockwise or counterclockwise. On that note, the game relies on swinging the knight throughout a board and using momentum/trajectory in your favor to not only bounce off walls/the ground collecting precious stones, but also avoiding a variety of enemies, including ghosts and dragons. To that end, there are 11 knights to choose from with unique abilities, along with 20 upgrades and power-ups, from a last chance bomb that grants an extra life, to a magnet that attracts nearby gems; we didn't see these items in action. What makes the game so addictive, aside from the concept, is the fact that the developers at Dancing Dots threw a timer into the mix, as the knight(s) slowly loses hearts the longer it takes to meet the required task. What's more, you have bonus objectives to worry about, such as rescuing 10 princesses and scoring 6500 points during magnet activation, among others. Throw in online leaderboards, and Knights of the Round Cable may suddenly become that App Store game you simply cannot put down. Chillingo certainly hopes that's the case, because with Catapult King currently occupying the number one paid games spot, it would very much like to have another mega hit on its hands.